Some books that I read now as a mother hurt my heart much more than I'm sure I would have noticed before. Out From the Underworld by Heather Siegel is one of these books. At the very beginning of the book, just before the prologue, she writes "...this is, unfortunately, a true story." As soon as I saw those words, I knew this was not going to be a light, summer read. Heather tells the story of her dysfunctional childhood, along with her older sister, younger brother, and troubled father. In a similar style to Jeannette Wall's The Glass Castle, Out From the Underworld is captivating right from the beginning. It's one of those fascinating books where you know the protagonist (the author, Heather) perseveres to a happy, healthy place on the other end, but you just cringe in reading about what she and her siblings had to go through to get there. While it's hard for me to say that I "enjoyed" reading about someone else's difficult childhood, because I wouldn't wish this upon any child, I did love Heather's writing style and storytelling. I appreciate the strength and courage it must have taken to share her story with the world. I hope you read it and hold your little ones just a little bit closer when you're finished. 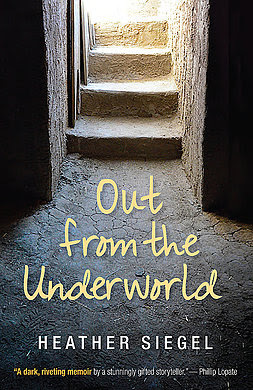 Keep reading below for an author interview with Heather Siegel and a giveaway to win a copy of Out from the Underworld as well as a music CD from her brother, Greg Fine. How did you do research for your book? Well, since it is a memoir and since many of the people I write about are alive and well, I did reach out to them to get their take on certain events, as well as their perception of what they remembered. I also found photographs and documentation which helped, as well as some old journals I had kept. Did your characters you wrote about agree with your perception of events? I am the middle child—the Jan Brady-- and this book is told through my perspective as a middle child, though it is told in an adult voice. I have spoken to my older sister and my younger brother about the story—they have both just finished reading it. They agree with the facts; there is no disputing the linear plot points of the story. But how I chose to view my father, for example, was different than how my sister saw him. She kind of…idolized him in a way I didn’t. But that’s life. In every family, children have different relationships with their parents. I’ve always challenged my father in a way that my sister felt uncomfortable about. As the oldest, she was, and remains, more of a caretaker type. One could even argue that she is an enabler. It’s something I discuss in the book. If you were stuck on a deserted island which three books would you want with you? Wow. Ok. The first one I would choose would be The Seven Mysteries Of Life by Guy Murchie. I have the book and I still haven’t gotten through it, but it is beyond fascinating. That book will probably take me a lifetime to read. Then maybe something spiritual by, say, by Deepak Chopra. Something to keep me motivated so I don’t lose it. And finally, I’d need some kind of survival guide. Or maybe a book on edible and poisonous vegetation. Mostly at home. But sometimes I sneak it in at work. What is your job other than writing? I am currently involved in a health market/juice bar as well as a natural beauty bar. I’ve been a small business entrepreneur for over twenty years. My pursuits started out as a way to survive—in fact the first business I ever opened was a coffeehouse when I was 25 years old and decided that I needed to do more than waitress and work for peanuts at an obscure magazine. From there, I grew to love the service business. It helps me balance my solitary life writing. And it has become another sort of creative outlet for me. I did try a stint in teaching—also in my twenties—but I was way too young to be helpful to anyone then. Maybe one day I will go back to it. What’s the most courageous thing you’ve ever done? choices, both on and off the page. It doesn’t serve anyone, most especially oneself, to fake who you are. Heather Siegel holds an MFA in nonfiction writing from The New School. Her work has appeared on Salon.com and in The Mother Magazine and Author Magazine, as well as in various trade publications. She was a finalist for the 2010 Pacific Northwest Writers Association Literary Award in Nonfiction Writing, the 2011 San Francisco Writers Conference Nonfiction Writing Award, the Carolina Wren Press 2012 Doris Bakwin Award and the 2012 Kore Press First Book Award. A multi-creative person with interests in the arts, nutrition, health and beauty, she has founded several independent businesses, including a coffeehouse, a café, an organic juice bar and a natural beauty bar. She currently lives with her husband, Jon, and daughter, Julia, in the woods of Long Island in a house filled with light. Win one of five print copies of Out from the Underworld and a music CD from Greg Fine (Open to USA & Canada). If the giveaway widget isn't working, click here and scroll down.